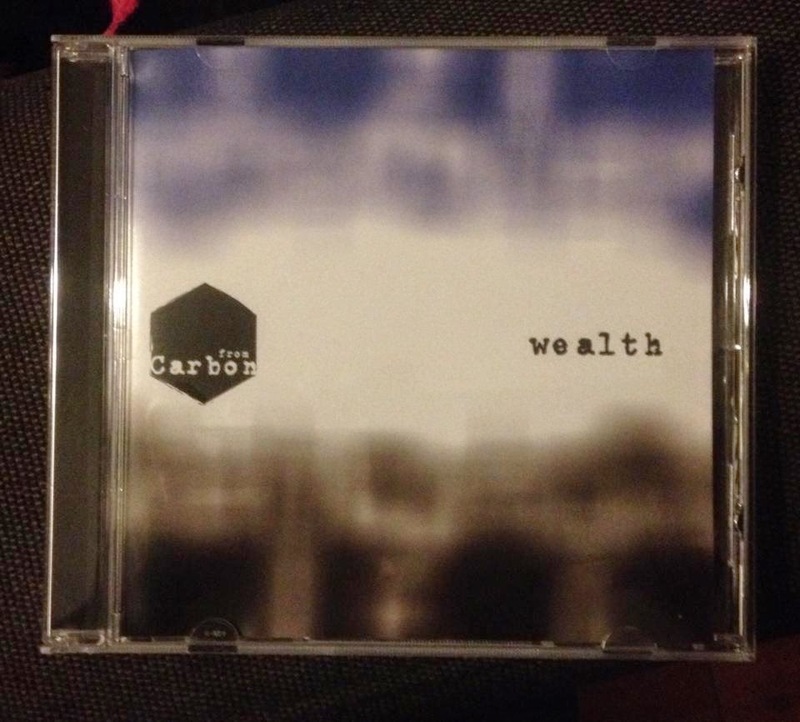 Wealth is the debut album by Manchester four-piece From Carbon. It features twelve tracks of exquisitely crafted indie-guitar that'll nestle itself in your head and have you stretching for the repeat button. For a band that's been together just over a year Wealth is a remarkable achievement. From the opening drum beats of Velvet to the closing haunting distant reprise of Sad Apples, this is the sound of a band that's honed its craft and have an intuitive songwriting ability that brings the best out of each of the members. There's no flash flourishes or anything significantly groundbreaking in terms of the sound on the record, but rather than that be a weakness, it's probably its biggest strength - twelve great songs that don't pretend to be anything they're not and which, through their openness and wide-eyed honesty, keep the listener engrossed. Opener Velvet is typical of the positive feel of the album (even if the subject matter of the lyrics isn't always quite so), it's simple chorus of "I want to world to know I'm alive" marking out the record as one that's uplifting, both in its vocals (even when frontman Scott is in more reflective mood), but also the impact the music leaves behind. It feels anthemic, but without displaying any of the trite, obvious traits that quite often go with that territory and that theme runs throughout the album from start to finish. As a result there's no real standout track to speak of. Powerful drums form the cornerstone of much of the album, around which bass, electric and acoustic guitars create the framework for impassioned vocals, no more so than on third track Darkness where Scott pleads for the darkness to rescue him. There's a seedier more mysterious feel on subsequent track Berlin without betraying the strong songwriting principles that serve them so well across the whole piece, whilst Pure, with some distinctive violin underpinning the chorus, is an honest open assessment of a broken relationship. Penultimate track Understand clocks in at nearly six minutes and sees them bolder and more expansive than on the rest of the record. It's this variety throughout that makes Wealth an album that you'll see through to its end. When closer Sad Apples feels like it's building to a big, strident chorus that's seen on earlier tracks, it drops into haunting violin that matches the sombre mood of Scott's vocals - "you lift me up and keep me there, without a hope, without a care" and as it draws the album to a close, the haunting distant reprise that finishes off the record perfectly. The great thing about Wealth is the consistency in the standard of the songs. Whilst most bands produce an album with a few stand-out tracks and some filler, From Carbon have twelve songs here that never dip in their quality and with enough variety to keep the listener interested across to close to the hour that they cover. From Carbon's website can be found here where the album can be purchased. It will be released digitally and (hopefully) on vinyl in 2015. They are also on Facebook and Twitter. From Carbon also play the Pop Up Winter Festival at the King's Ransom in Sale on Saturday (December 13) at 4pm.